These facilities are available to all UNL faculty, to companies in Nebraska, and to outside interests. The purpose of these pages are to serve as a guide to the capabilities and equipment available in each facility. Facility specialists and supervisors are available at the contact information on each page to personally answer additional questions. View the location of the NCMN facilities and contact information for the specialists. The research was performed in part in the Nebraska Nanoscale Facility: National Nanotechnology Coordinated Infrastructure and the Nebraska Center for Materials and Nanoscience, which are supported by the National Science Foundation under Award ECCS: 1542182, and the Nebraska Research Initiative. 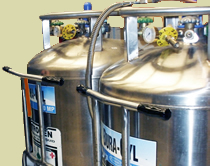 The Cryogenics Instrumentation Facility provides the means for obtaining liquid nitrogen and liquid helium for low-temperature research, cold traps, etc. The scope of this facility is materials characterization of the topography, morphology, elemental composition, crystalline microstructure, crystal defects, and atomic arrangements of materials, largely on a scale from 10 micrometers down to the near-atomic level. Two sputtering systems have been established to fabricate a variety of thin films, especially the nano-structured films including overlayers, multilayers, granular solids, clusters, etc. Two tube furnaces are available for sample (target) annealing, doping, and sintering. 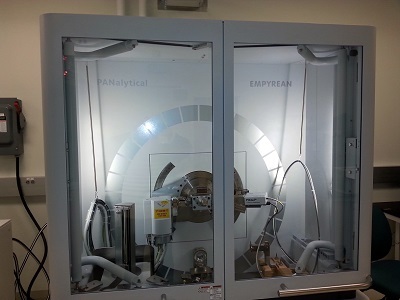 The Nanofabrication Cleanroom Facility contains a large variety of equipment to prepare, fabricate, analyze, and characterize a wide range of nanostructure materials. 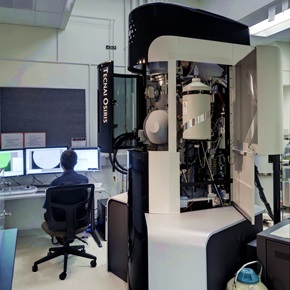 The Surface & Materials Characterization Facility employs a variety of very precise, non-destructive probing techniques (AFM, MFM, EFM, LFM, STM, and PFM) for imaging and measuring surface properties of materials from the micron level down to the atomic scale. This facility also contains a large variety of equipment to characterize the mechanical and physical properties of a wide range of materials and focuses on using the many materials characterization aspects to perform failure analyses on components. The X-Ray Structural Characterization Facility is dedicated to materials identification and characterization through nondestructive, X-Ray Diffraction (XRD), high-resolution diffraction for analysis of thin films, complete structure determination of single crystals (crystallography).